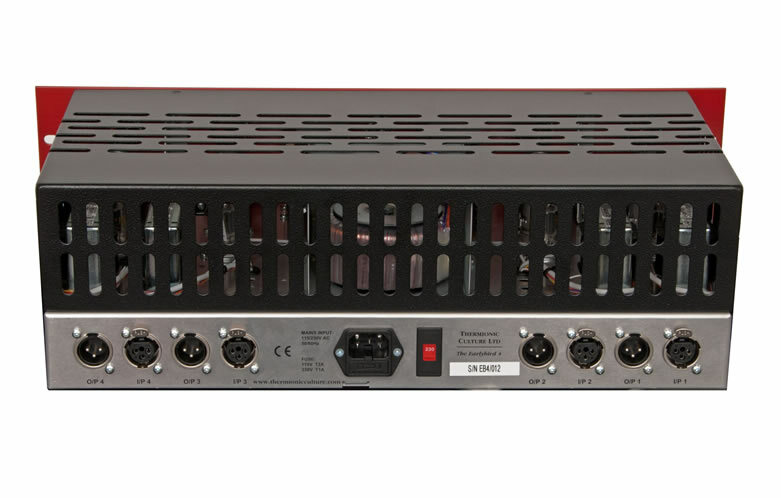 4 Channels of extremely high quality push pull' 'class A' type of valve pre amplification. Clean gain, giving the lowest noise and distortion figures possible in a mic. Amp. Lowest phase shift and highest headroom. Switchable input impedance to help in matching the unit with different microphones. Switchable 48V phantom power . Switched gain 42 dB to 62 dB, 20dB pad. 2 position high pass filter. Variable output trim with phase inverter. Vu meters switchable between channels. 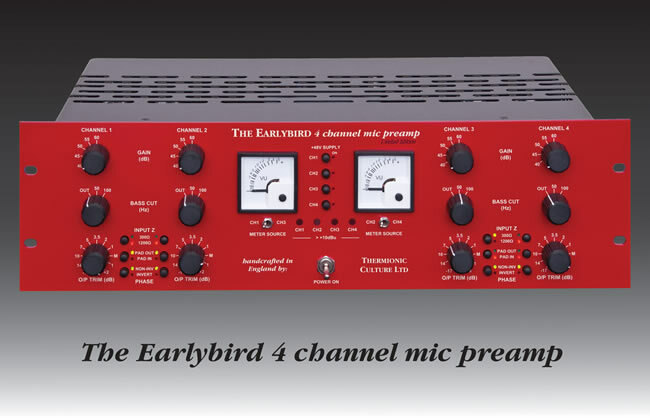 The Earlybird 4 contains 4 channels of extremely high quality valve pre-amplification. Originally made in black in 1999, this is a special “revival” limited edition in red (limited to 49 only). 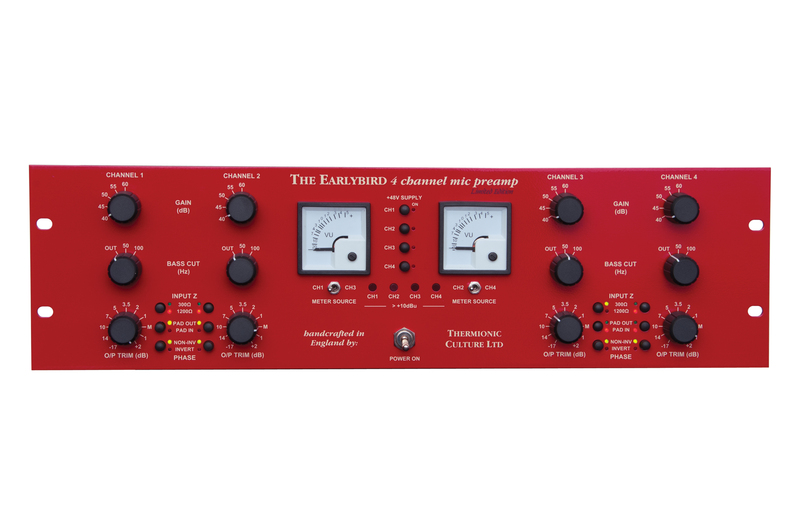 The black edition is still available with the updated circuitry..
As the individual channel circuitry in this version of the Earlybird has been simplified in order to provide 4 channels in one 19” unit, so the individual channel specifications have risen. Thus making this the most natural sounding, high quality version of the Earlybird preamp to date. Effectively giving the user the cleanest possible valve gain with a range from 3dB to 62dB and a switchable input impedance to help in matching the unit with different microphones. This is one of Thermionic Culture’s all handwired products with point to point wiring throughout. The circuit design utilises a ‘push pull’ ‘class A’ type of valve amplification in order to provide ultimately clean gain, giving the lowest noise and distortion figures possible in a microphone amplifier. The input and output transformers have received special attention and by working together with Sowter transformers, designs have been created that bring better results than ever before. The lowest phase shift and highest headroom are both benefits brought by these designs. It’s unusual to hear a mic amp with the Earlybird 4’s qualities and after years of improvements Vic Keary proudly declares this “The best, most real mic. amp ever ”. We hope that on hearing the unit’s beautiful results yourself, you will agree with Vic. The pair of VU meters show the signal levels for 2 selectable channels. VU meter A is switchable between channels 1 and 3. VU meter B is switchable between channels 2 or 4. 4 red LEDs light up when the output of the amplifiers exceeds +10 dBm, though don’t worry – there’s still 20dB of headroom left in the Earlybird!